Nowadays, every online marketing is becoming a trend be it an affiliate marketing, email marketing, share marketing, etc. In this blog, we will focus on affiliate marketing that helps you to promote your business by the means of affiliates. But to follow the trend, you have to know about affiliate marketing? So, let us quickly take a look at the basics of affiliate marketing. If you have a company where you manufacture & sell products and services to your customers. But, you didn’t generate sales as much as you planned! So, to increase your sales you can hire some affiliates that help you to promote your products & services by referring them to other platforms & eventually generate sales. I hope to know you can understand about the affiliate marketing. So, now we can discuss on “5+ Best Affiliate Marketing Software” that enables you to generate sales easily. Pabbly affiliate system is the leading software in the stream of affiliate marketing that helps you to increase product sales. This software provides a platform where you can generate business sales by promoting the products & services with the help of affiliates. So that they can easily get their referral reward for every purchase. 1. Merchant – In Merchant dashboard, merchants get different options like commission rule, generate reports, checkout page, affiliates management, add products, etc. that helps to analyze details about every sale. In this, you can provide commissions to affiliates with two basic options like flat or percentage. 2. Affiliate – Affiliates can manage their accounts by having a quick glance on an invoice, available credits, contact & account details along with edit profile option. Even, this SaaS-based software is also equipped with one of the best subscription & billing management system to manage the sales of products & services. Email Notification – With this feature, both merchants & customers get email notification for any signup/login, purchase, transaction, etc. Payout Settings – In this, merchants can provide payout options like instant or manual with payment methods like PayPal and other methods are coming soon. Cookie Lifetime – This feature enhances the functionality of merchants in which they can decide the time period for a particular affiliate link to provide commissions. Customer Portal – In Pabbly affiliate system, you can provide customer portal option where your customers can sign-in & create their accounts. Further, with these accounts, they get various options like profile management, invoices, transaction details and more. Affiliate Target URL – With the help of this targeted URL merchants can easily provide rewards to a particular affiliate for referring their products. Further, these URL enables merchants to reward the associated affiliates for referring/selling their products. Discount Management – Merchant can create an unlimited number of coupons & provide flat or percentage discounts to customers for subscription plans, products & services. Besides, you can also avail various features like recover failed payments, upgrade & downgrade plans, checkout page customization, exclusive tax collection, rapid billing (one-time & recurring), sales analytics, API framework, multiple gateways, unlimited invoices and more. 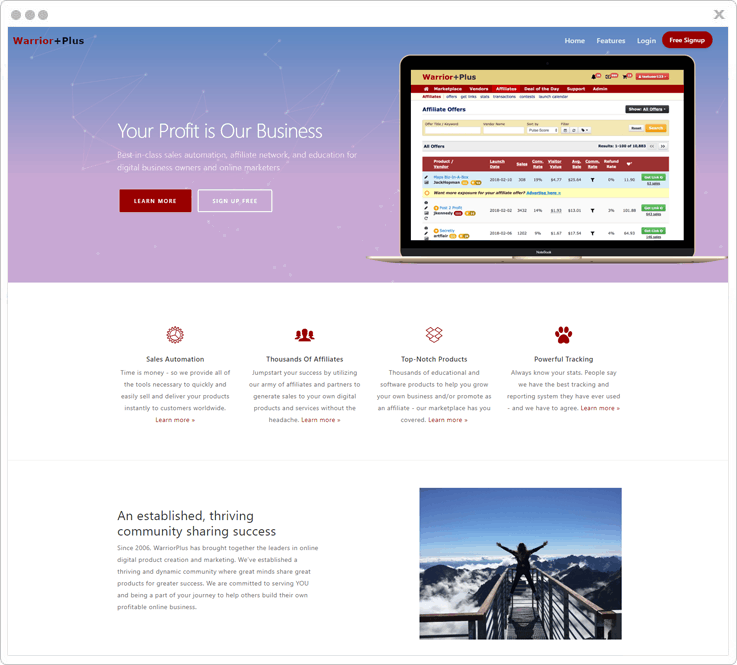 Starter – This plan costs you $7/month where you get features like dunning management, upcoming affiliate system, add 5 customers option, tax management, custom domain, etc. Rookie – With a cost of $29/month, this software gives you all the features of the Starter plan with additions of 1000 customers. Pro – In this plan, you get unlimited customers addition option & all the features of both the Starter & Rookie plan with a price tag of $59/month. JVZoo provides you an easy to use online affiliate marketing software that helps you to grow your business online. In addition, you can promote the products and services on other platforms via affiliates and give rewards to them for promotions. In seller’s dashboard, you can facilitate the sellers with multiple options like custom checkout banners options, customer management option, sales funnel and more that helps in easy handling of customers, clients accounts with reports & transaction details. Whereas in affiliate’s dashboard, you can provide options like webimates, transactions, etc. that helps you to promote products & services of sellers on a different platform to earn money as a commission from sellers. Product Transfer – With this feature, you can transfer products to another merchant/seller for selling the product. This process occurs when both the parties/sellers accept the agreement terms like affiliate relationships, commission rules, sales stats, etc. Webimates – JVZoo allows you to manage listing of webimates easily. Here, you can request multiple groups to promote your products through their webinars & subsequently decide commissions for each group. Split Tests – Split testing gives you the most effective way to increase marketing campaign performance. With this feature, a vendor can compare the test results of product and get an insight into related details of the best version of the product. Ad Widget Creator – With Ad widget creator, you can create & style promotion widgets with different color options, background style, etc. according to your choice. In addition, JVZoo also comes with custom filtering, product launch list, Zapier and more. If you want to progress in your business, then you are in the right place because WarriorPlus is the best platform that gives you opportunities to enrich the sales of your website. You can perform a lot of functions related to brand promotion on other platforms via affiliates & giving them referral rewards for every sale. WarriorPlus has the simplest marketplace that enables you to get a quick glance on top sellers of last 30 days along with options like search box, products list, etc. Vendors Dashboard – In this dashboard option, you get customer management, sales report, commission rule (rule type – time-limited, multi-tiered, affiliate purchase), daily stats and many more options. These options help vendors to present your products & services in an appropriate way by means of which you get an increase in sales. Affiliates Dashboard – Affiliates dashboard gives you features like stats, transaction date, product name, sales price, offers, get links, and more that helps you to get more options for promoting products & earn rewards. Sales Funnel – This is the best feature of WarriorPlus that enables affiliates to sell more products to the customers by offering other related products to them while selling a particular product altogether. Product Alerts – You can get instant notifications via email, RSS, or both when the latest products that contain certain keywords related to the product are posted by different vendors. Launch Calendar – With this advanced feature of this affiliate marketing software, affiliates can schedule the launching of new products to manage their workflow in terms of dates, time, location, etc. Ads Management – You can purchase & manage ads section with the help of this affiliate marketing software in terms of length, cost, a preview option and more. OSI Affiliate empowers you to create and generate sales to grow your business easily. In this software, you can also explore sections for resources, customers, contact us, login, blog subscribe section, commission & payouts option, auto signup option, etc. This affiliate marketing software offers you many features which are useful for affiliate marketing with resources & 15 days free trial option. 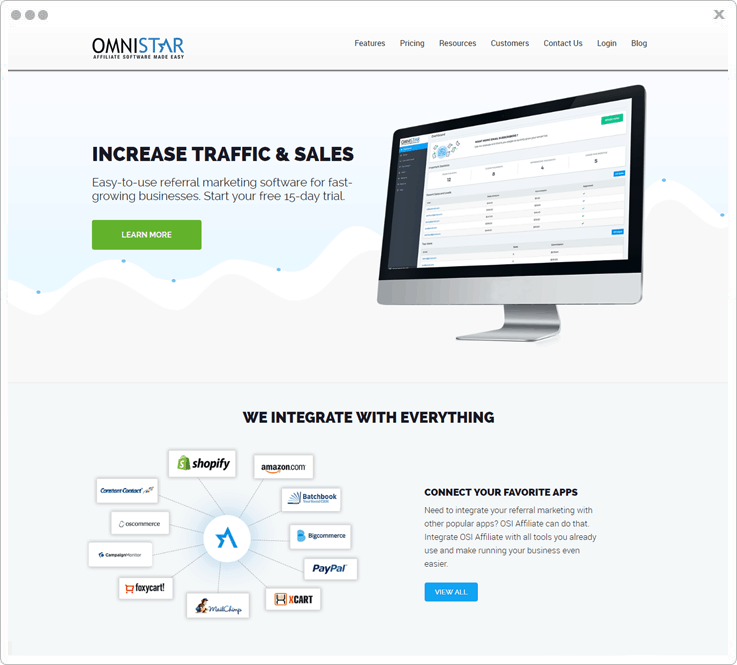 OSI Affiliate is the growing affiliate marketing software that works on three principles i.e. integration, attraction & growth. 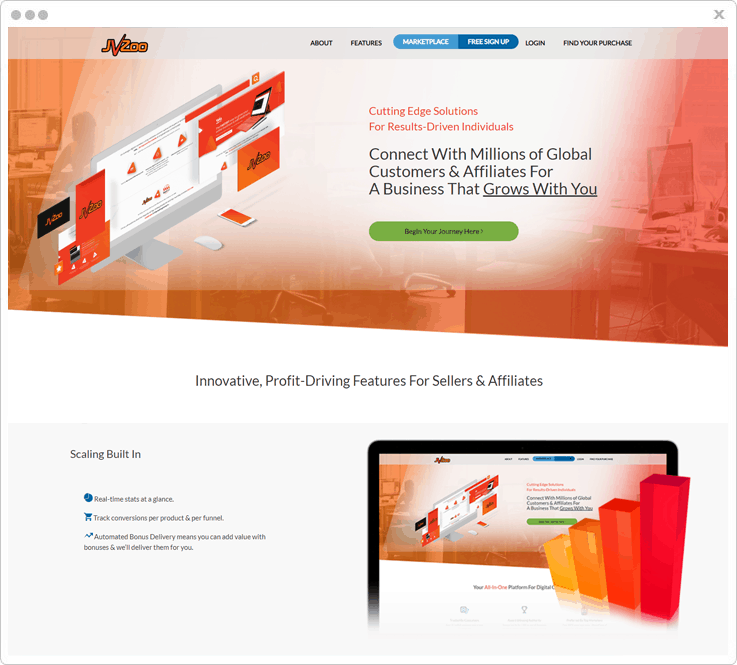 In a descriptive manner, with this affiliate marketing software, you can create an affiliate program & integrate it with your website to promote products & services. With the help of this integration process, your customers can easily enhance your business by referring it to others. Consequently, with this process of cyclic integration, you get new customers from trusted recommendations. Contest Manager – You can organize contests for your promoters to encourage them. So they can promote more products & services of yours on the big platforms to earn rewards. Partnership Automation – With this feature of OSI Affiliate system, you can promote your products & services by making partnerships with others. These partners help you to increase your sales by promoting you with their audiences. Automatic Customers Enroll – Easily enable our referral partner auto sign up feature which will automatically register every new customer that purchases from your store. Tools Integration – OSI Affiliate have some integrations like Shopify, WooCommerce, Drip, MemberPress, etc. that helps you to promote your business. Basic – With a price tag of $47/month, you get a Basic plan of this affiliate software with features like 20000 tracking requests, directory listing and more. Professional – This plan costs you $97/month where you get all the features of the basic plan along with an addition of opt-in forms, customizable thank you pages, etc. Premium – In this plan of $247/month, you get features all the features of both the basic and professional plan and also get 1 million tracking requests, 5000 affiliate users option. ShareASale is the complete package that comes with features allow you to make your business grow with some exclusive strategies. This software gives sign up/login options for merchants and affiliates. ShareASale offers you technologies that receive accolades for speed, efficiency, and accuracy. Our objective is to provide an advanced affiliate marketing platform to customers. Direct Deposit – This feature of ShareASale is very helpful for you as an affiliate or promoter. With this, you can easily deposit commission into your account which you earn by promoting products. 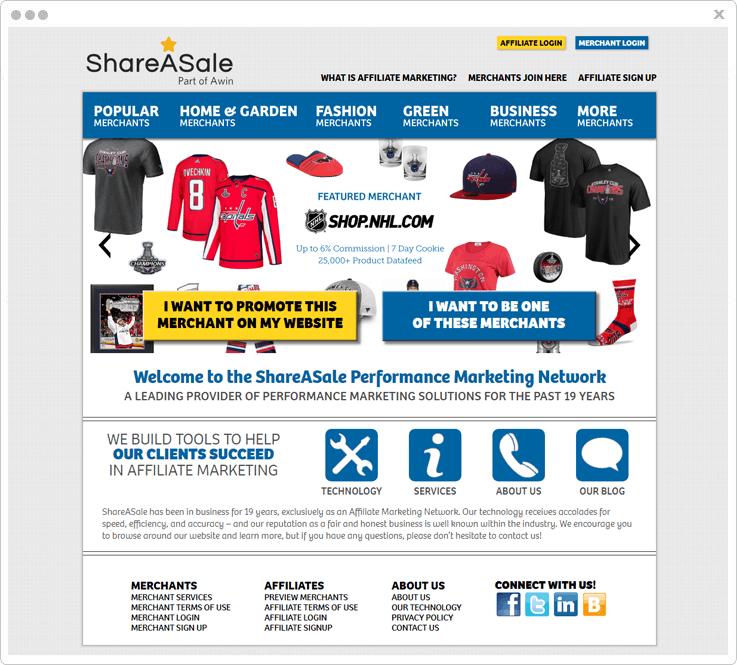 Deep-Linking Tool – ShareASale comes with a deep linking tool that allows you to create the affiliate program for any particular e-commerce product of your choice. Video Creatives – You can create & add “how to” or promotional videos on your website to provide information about your business, affiliate marketing and more. 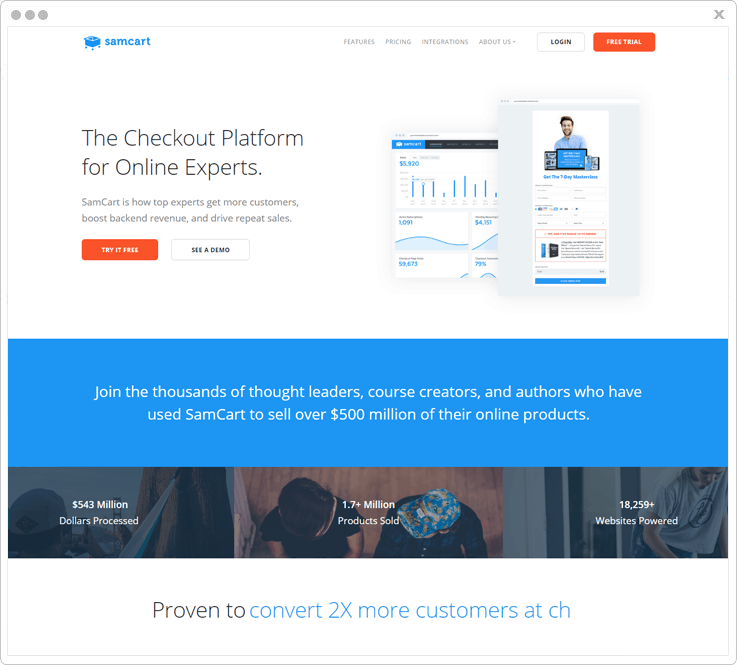 SamCart is the affiliate marketing platform that features 1-click upsell, order bump, and payment plan capabilities that are designed to maximize profits from every sale. Order Bumps – You can increase your sales by letting customers to easily add multiple products at checkout page without creating a new one. Email – With this feature of SamCart, you can easily manage your customers by communicating with them. This affiliate software also offers you different tools like MailChimp, Aweber, Convertkit, and more for email communication. Free SSL Certificate – Confidently create secured checkout pages that are completely SSL-certified and served via HTTPS. 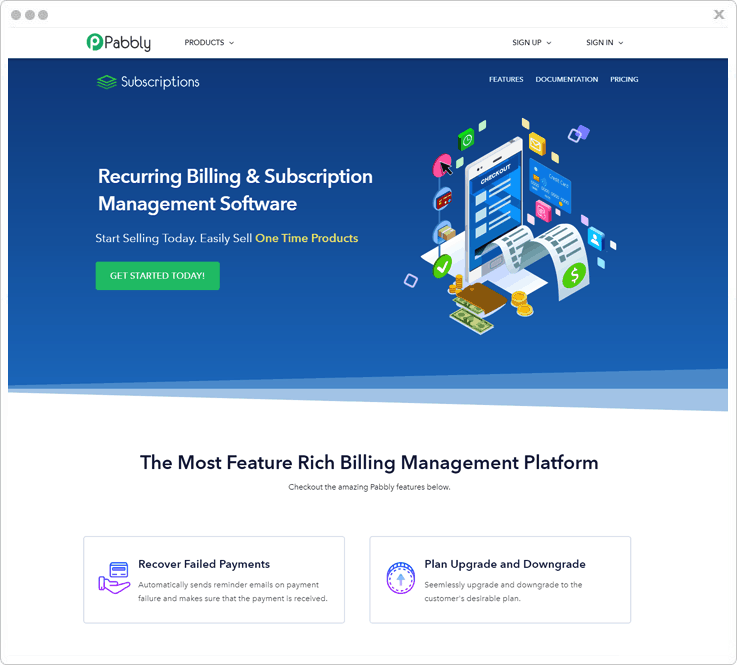 Subscription Saver (Dunning) – In addition, this software allows you to automatically recover failed subscription payments with this easy way and also allow subscribers to update their credit card info. SamCart comes with two estimated plans. Pro – It costs only $99/month in which it includes advanced stats & reports, prospects (cart abandonment), 1-click upsells and more. Premium – In this plan of $199/month, you can enjoy all the features of the PRO plan with some additions like the affiliate center, dedicated training & support, subscription saver (dunning). Above, we gave information about “5+ Best Affiliate Marketing Software” that will always help you to enhance your market value. All these software comes with basic along with some unique features that will make your affiliate business stand out.